Clearance is my favorite word. I had never intended to review this purchase. I had little actual intention of ever buying one. But clearance, that old Siren, had me hooked, set and reeled in. This is another yearly item that’s around for one week and then goes away for 51. 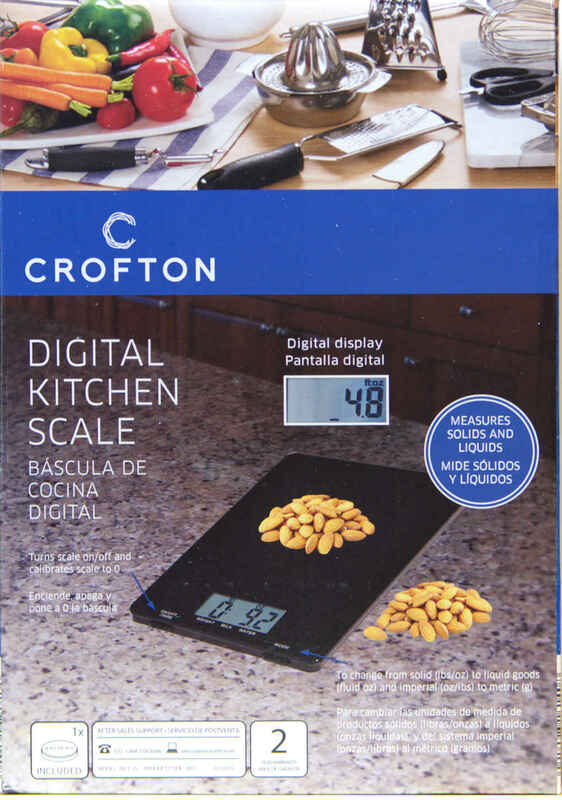 Each year I’d see the advertisement, take a quick peek as I passed them in the store and reasoned, “Do I really need a kitchen scale?”, as I walked on by. After all, people have cooked for millennia without kitchen scales. However, the markdown sign said $5 (half off the regular price). I couldn’t do any better at a yard sale. I couldn’t resist the bargain. I’m glad I bought it. For one, it looks great. It’s slim, shiny black, reasonably small and looks like a tablet computer on the counter. It has an 11 pound (5 kg) capacity. That means I can, and have, verified the weight of my 8 pound dumbbell. It’s 8 pounds 4 ounces, or 3747 g. I feel much healthier now that I know I’ve been pushing at 103% for all these years. The triceps are burning right now! I’ve used the scale to precisely measure my morning brew. I can tare the scale to the weight of a small glass and then add coffee beans directly to the glass directly on the scale, so I know precisely without subtraction or math of any kind how much coffee I’m about to brew. I then grind the beans, add the grounds to my french press, tare the scale to the french press with the coffee, add, once again precisely, the hot water to the french press on the scale and without any kind of computing device know I now have the perfect proportion of coffee to water for the perfect cup. Unfortunately, I found, I’ve been doing it all wrong without the scale. But more on that later. With a regular price of $9.99, this is still at the very low end of prices for similar scales, which generally range from $12 to $20. Some of those other scales have higher weight capacities. Although I can’t see a need for weighing an 18 pound frozen turkey on any scale. So, if you really need to know how much your under 11 pound dumbbells weigh, just wait for about 51 weeks and pick one up at the regular price. Or if you’re like me, wait about 52 weeks (or any multiple thereof), check the clearance bin and you might get lucky. This entry was posted on 01/24/2015 at 08:24 and is filed under ALDI, cooking and related items, food, Recipes, food, cooking and related items. You can follow any responses to this entry through the RSS 2.0 feed. You can leave a response, or trackback from your own site. what time of the year have you seen this, I’ve been looking for it. I wrote the review at the end of January. So I guess that’s around when I found it. In fact I believe ALDI had many kitchen items out a few weeks ago. So you may have missed it. There are other similar kitchen scales around at a similar price. I can’t speak to them, but I expect most would be reliable. I still have the ALDI scale and use it daily. I’m on ly on my second battery. They last a long time.